You want to know the secret to a long and lasting romance? Talking about your intestinal bacteria. Seriously, ladies. Nothing makes a man swoon like explaining how your everyday good bacteria has migrated to the wrong area of your body, from your colon to your small intestine. In fact, even if you don’t have SIBO or IBS, I’d highly recommend working the word colon in at some point during your second date to make sure he’s a keeper. And I am only partially kidding!! 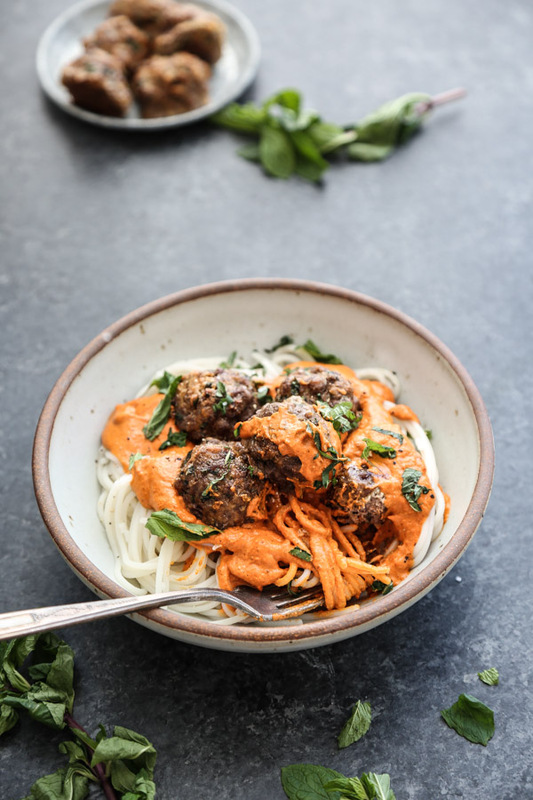 On the one hand, I’m incredibly grateful that I can troubleshoot my low FODMAP diet—sans garlic, onions and all—in the private sanctuary of my own shared home, knowing that on Valentine’s Day, I have a captive, enthusiastic audience to share a Lady and the Tramp moment over this bowl of allium-free Spaghetti and Spiced Lamb Meatballs. On the other hand, I’m not sure our romance would have entered this stage of intimacy if our courtship had never involved discussion of my gut bacteria. If you’ve read The Wellness Project book, you know that Charlie and I found out fairly early into our relationship that we had a shared intestinal parasite. 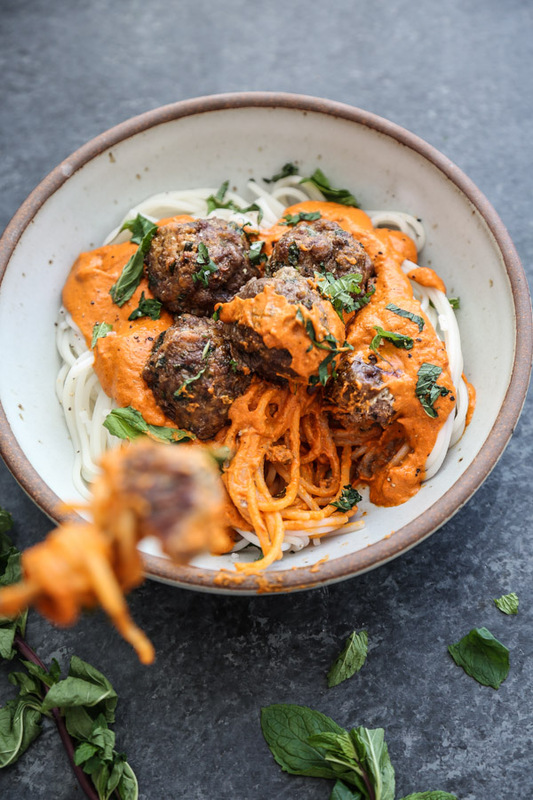 While I worried about how all my dietary restrictions and wellness experiments would go over when we first met, I hadn’t anticipated this particular health road bump would ever be on the menu. But oh, it was. And boy, am I grateful for all the gut baggage we each brought to the relationship. It forced me to get over my desire to be The Cool Girl at all times, and to have hard conversations about aspects of my body that years ago I might have been too embarrassed to discuss even with my best girlfriends. Okay, that’s a lie. I’ve been talking about my girlfriends’ poop for years… But never with boys. And especially not boys I wanted to see for a third date. These conversations really were proof that I had found a guy worth keeping, in sickness and health, and likely countless more elimination diets to keep me as part of the latter category. Which is all to say: no matter who you’re celebrating with this Valentine’s Day, don’t let your health be a barrier to love. I know that sounds trite. But I’ve let it happen before. And now that I’m older and wiser, I can attest to the fact that any partner worth keeping won’t let any dietary restriction be a deal breaker. 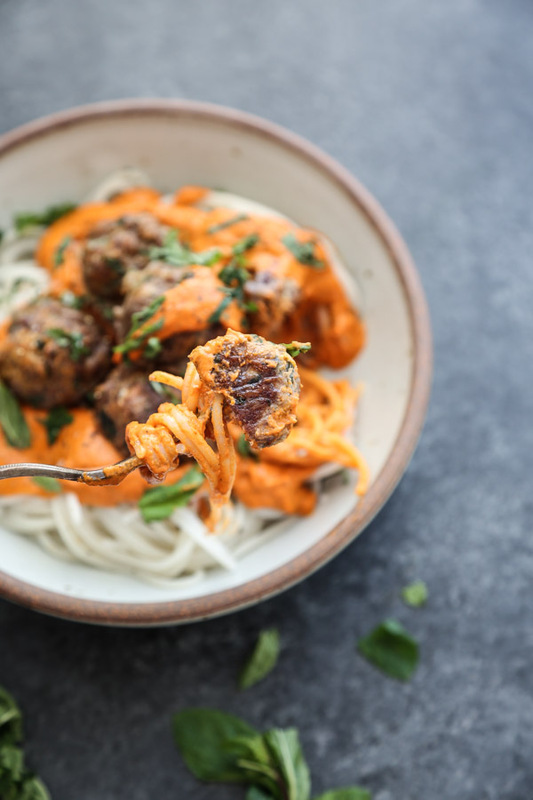 If you’re looking for something delicious to enjoy on your day of love, I highly recommend my romance back pocket spaghetti and meatballs. This version uses lamb, almond meal instead of breadcrumbs, and plenty of spices and herbs to make up for the lack of garlic and onion. 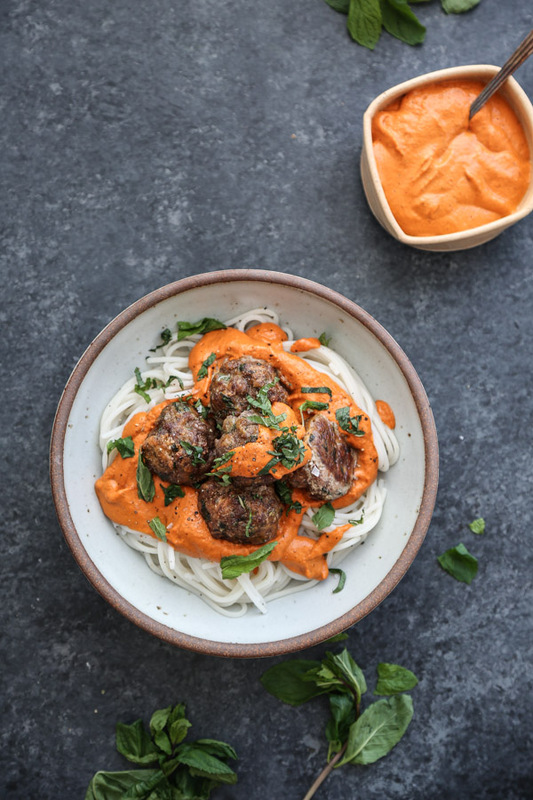 It’s slathered with a quick no-cook red pepper and sundried tomato Romesco that gets super creamy in the blender and is the perfect complement to the spiced lamb. It might also be my lover/Tramp’s new accessory, since he managed to enthusiastically slurp/splatter it all over all his clothes. 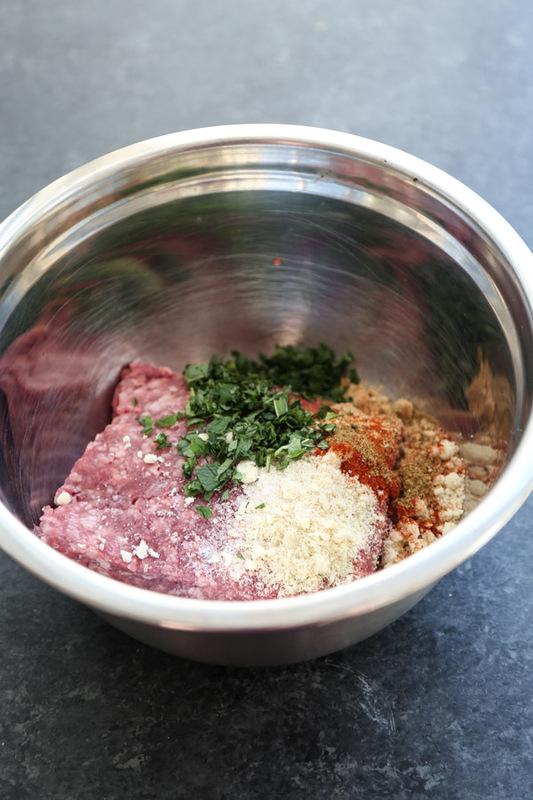 In a medium mixing bowl, combine the lamb, almond meal, egg, mint, tomato paste (if using), sea salt, cumin, ginger, paprika and cayenne. With clean hands, mix the lamb until well combined, making sure not to overly break apart the meat. Form the mixture into 12 equal balls, about 2 tablespoons of meat in each. Arrange on the prepared baking sheet and bake in the oven until lightly browned on top and cooked through, about 20 minutes. 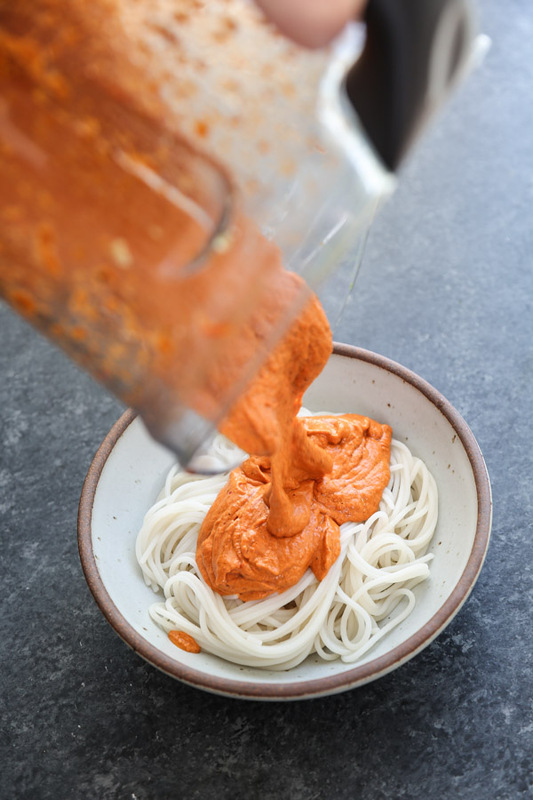 In the bowl of a blender or food processor, add the peppers, sundried tomatoes, almonds, olive oil, sherry vinegar, sea salt, and red pepper flakes. 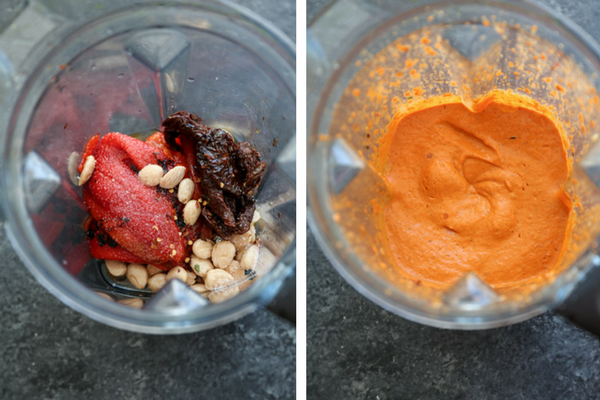 Puree until smooth, adding a splash of water if necessary to reach your desired consistency. For a Whole30 option, sub quinoa pasta with spaghetti squash or zucchini noodles. “Slurp/spatter”: ROFL! Actually this recipe is truly slurable. 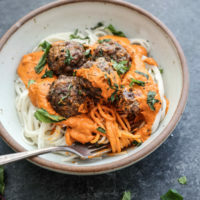 I’ve made something like these meatballs before but adding a sweet-ish uncooked sauce is a really fun idea . 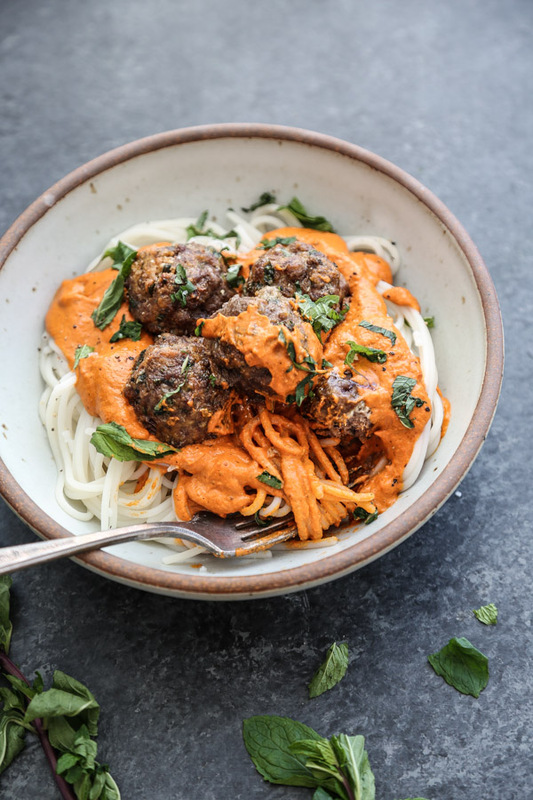 This recipe looks seriously amazing. Thankfully I don’t have the intestinal woes you describe, but I’d still make this recipe exactly as is. The sauce sounds fantastic! 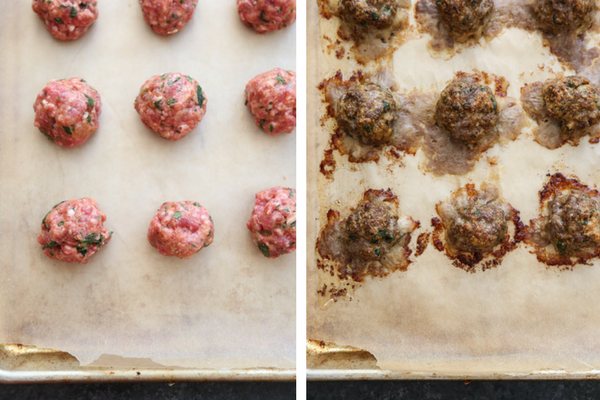 Ground lamb and cumin…smells a bit like soutzoukakia (Smynna meatballs), one of our all-time favorites! :):):) It goes without saying that this will be in our menu really soon lol. As for you and Charlie discussing these issues, this is really important. Nothing embarassing about being open with each other as a couple, ESPECIALLY when it comes to health issues. That is so great that you guys can communicate this good. Kudos! I’m OBSESSED with this dish. It’s been on heavy rotation for the past few months, and given it’s fall, I’ve been subbing spaghetti squash for the base. Pheobe, thank you for all the wonderful recipes. Your site continues to be a destination I always count on for healthy and delicious options. such a great idea to use spaghetti squash! 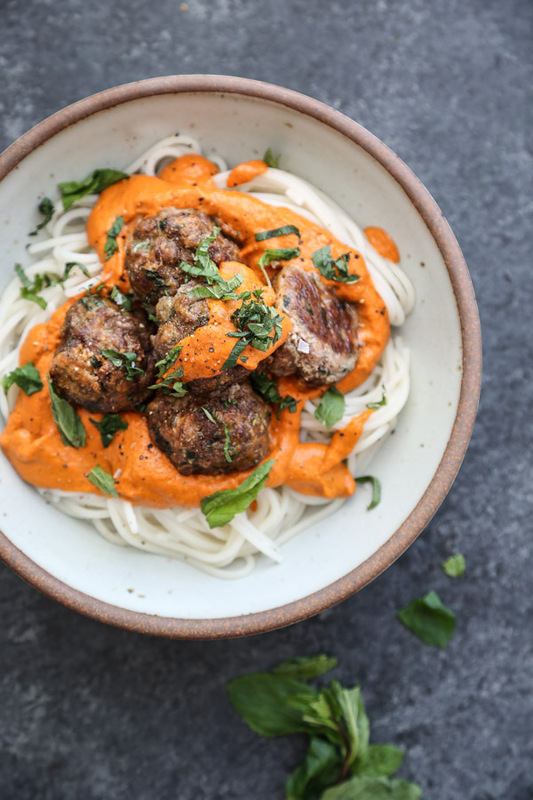 This recipe is soon to be made because it sounds yummy and, bonus, easy to pull off. I did want to point out after double and triple checking my own eyes (haha), step 2 is missing the 3Tbls of mint. Just thought I’d let you know. Have a great day. thank you for the heads up! fixed!